We build brick paver patios, walkways, and driveways. Do you love the outdoor living lifestyle? Building a new brick paver or natural stone patio is a stunning way to enhance your landscape and get more relaxation and enjoyment out of your property. Paving stone patios are durable and long-lasting, they look fantastic, and they are easy to maintain. What Type Of Brick Or Paver Project Do You Have In Mind? Do you want to build a beautiful outdoor cooking area? Do you want a patio with a firepit to enjoy the summer evenings? Do you need to rebuild an existing paver patio that has sunk? Do you want to create some walkways or garden pathways? Green Acres Lawn & Landscape is a licensed and insured Kansas City landscaping company that specializes in hardscaping services including the design and construction of brick and paver patios and outdoor living areas. 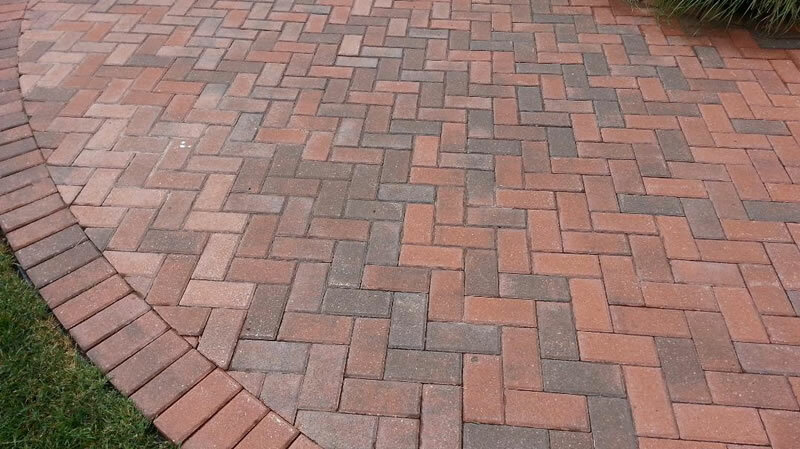 We design and build interlocking brick or paver patios, outdoor cooking areas, walkways, pathways. and even driveways. In order to have a great looking, long lasting brick or paver feature in your landscape the preparation work must be near perfect. This includes excavating and properly grading the area you’d like the brickwork installed so we can then install the proper base materials. Once we’ve laid the base down it must be compacted to minimize any material settling that will occur. Spending the extra time on the site preparation will prevent the new pavers from shifting which can cause dips and uneven surfaces. A significant portion of the cost to build your new paver patio is going to be in labor costs. We determine the surface area of your project. We consult with you on the specific brick or stone materials you’d like. We’ll provide you with an accurate written estimate to build your new patio. The amount of work required for this type of landscaping project can vary greatly from property to property dependent on many factors. The slope of your property, existing site conditions, drainage, size and scope of the project, the particular materials being used, and your budget will all be considered. We’ll be able to offer you an accurate estimate only after an initial site visit and material consultation. Let’s talk about your paver patio project! Give us a call (913) 422-5111 or fill out or online estimate request form and we’ll arrange a good time for a consultation to discuss your project.